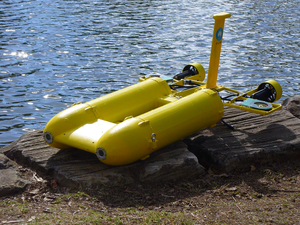 Developed by the CSIRO ICT Centre at its Queensland laboratory, Starbug is an autonomous, miniature submarine for underwater monitoring and surveying of ecosystems such as the Great Barrier Reef. Dr Matthew Dunbabin, leader of the team that developed Starbug, says: "Our vision is for low-cost platforms like Starbug to be deployed in large numbers to greatly improve data collection rates so that reef research can leap ahead." Starbug represents a radical new design philosophy which has resulted in a vehicle that is small enough to be operated by one person from the shore, floating platforms or small boats without the need for cranes and other specialised equipment. Starbug is one of the first AUVs in the world designed specifically with vision as the primary sensor for navigation and control. This means it does not need to be tethered and does not need an operator.